ARC's mobile and custom dashboards give you instant access to floor plans, shutoffs, evacuation maps and other critical building information during an emergency. Quick access to emergency plans, evacuation routes and floor plans is key to responding to an emergency. Similarly, the ability to update facility information, distribute policies and validate training is vital to effective emergency preparation. 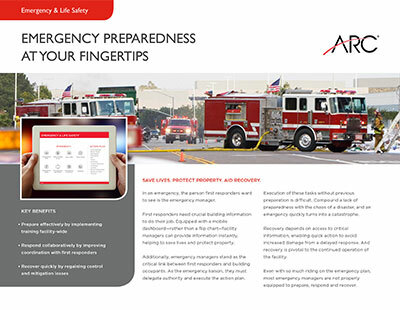 From floods and fires to active shooters, ARC's technology empowers facility and emergency managers with all critical emergency documents to better prepare and respond. When disaster strikes your facility, the decisions you make in the first seconds will determine the success and efficiency of your response and recovery. And yet 86% of facilities are not adequately prepared to respond to an emergency. Emergency Preparedness is about more than creating a plan; your facility needs the tools and resources to put your worst case scenario processes into action at a moment’s notice. 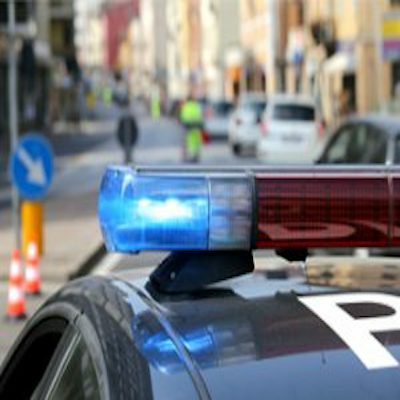 First responders will be relying on you to provide vital information in real time to safely and swiftly neutralize the danger and secure the building’s occupants. Be prepared to recognize and act at the first sign of a wide range of potential threats. 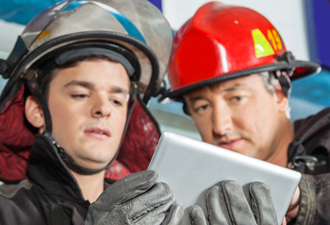 Initiate emergency response plans and communicate with occupants and first responders, providing them the information that they need in real time. Quickly regain control and start the work toward recovery. This is a critical part of all continuity planning. For an alarming number of today’s facilities, failure befalls even the best-laid plans for one easily avoidable reason: when tragedy strikes, they can’t access the vital information they need. When it comes to emergency preparedness, an EOP that you can’t retrieve when disaster strikes is equal to having no plan at all. Watch how ARC can help. When you’re completing renovations or a remodel, out of date building information can lead to costly mistakes, expensive delays, and dangerous circumstances. ARC’s software makes it easy to share the legacy and current drawings with project teams so you can make informed decisions and proceed safely. In the event of an active threat, first responders need to make life or death decisions with little time to spare. With just a tap, you can share the critical information they need to eliminate the threat, sending building plans, documents, and even live surveillance feeds to responders on the ground. Not every catastrophe starts out that way. With proper preparation and informed decisions, you can mitigate damage at the first sign of a threat. With mobile and offline access, you can find shut offs and other critical equipment fast and minimize damage and recovery time. ARC’s award winning mobile technology provides instant access to the critical building information you need – before, during and after an emergency. See how you can instantly access and share information in seconds. Emergency training, planning, and preparation are necessary practices for any facility. Even exceptional preparation needs the support of real-time intelligence to be it’s most effective, however. ARC’s Mobile Facilities Dashboard puts all of your facility’s critical information in the palm of your hand so you can access everything you need to recognize, respond, and recover from emergency situations. Mobile and offline access to your building’s emergency plan. Instantly access and share safe refuge areas with employees during an emergency from any mobile device. Access and share shutoff locations and instructions with your team in seconds. Share floor plans with first responders and others. Access all of your Safety Data Sheets (SDS) for any room on any floor instantly. Mobile access to asbestos abatement reports. Evacuation Maps and routes available at your fingertips. All your critical building equipment locations and models on your mobile device. Fire protection floor plans for each floor of your building. 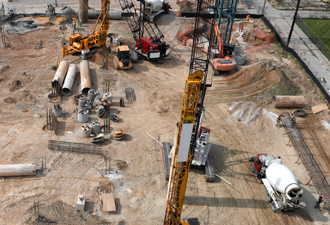 The most current construction drawings for all underground utilities. Always have access to the most current emergency contact list. All of your critical emergency training materials available from any mobile device. ARC provides the ability to retrieve information from any device, at any time. Immediate access enables better coordination with first responders which saves lives and protects property. Responding to an active shooter, bomb threat or natural disaster shouldn’t include searching through a file cabinet. Action plans organized by building enable the facility manager to adapt quickly and definitively during an emergency. The mobile dashboard navigation is intuitive and custom-built based on your specifications. The result is an organized, searchable index for all your emergency preparedness information. When dealing with a disaster, every passing second can either worsen or improve the situation. 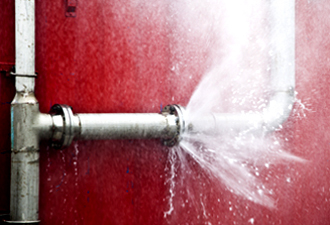 Emergencies don’t slow down while you find your flipchart or hunt for a shutoff valve; in just thirty seconds, fires can grow out of control and can double in size in one minute. You need to quickly recognize the threat so you can activate and communicate your response plan. Facility teams, on average, respond to a catastrophe every two years, and the median cost of recovery exceeds $500,000. No matter how well prepared you are, you can’t stop disaster from striking. You can, however, reduce catastrophic costs by mitigating your risks and expediting your reaction and recovery. ARC’s information management dashboard helps mitigate risk before, during and after an emergency. Quick access to shut-offs means small problems don’t become big ones. The success of your disaster response and recovery depends on the split-second decisions that facility managers make. Good decisions require good information with up to the minute access to real-time conditions. You can’t hide from catastrophe, but with robust planning and mobile information access, you can make informed decisions that can help to mitigate costs and prevent small accidents from turning into large-scale disasters. The National Fire Protection Association (NFPA) revises the Life Safety Code (also known as NFPA 101) every three years and, unlike many other safety codes, it applies to both new and existing structures. Jurisdictions throughout the United States may adopt all or part of the code and its subsequent revisions as local law, requiring all structures to comply with the updated standards in order to protect a building’s occupants and lessen the impact of fire and associated disasters. While some emergencies will necessitate a shelter-in-place order, others will require everyone, including your security team, to evacuate to safety. With ARC Emergency, live video feeds are available on mobile devices, so leaving your post doesn’t have to mean leaving behind the critical intelligence gained through real-time surveillance. Whether evacuating to a safe refuge area or sheltering in place, you can make pivotal adjustments to your response and share surveillance directly with first responders so they can evaluate and assess the situation before entering the building.